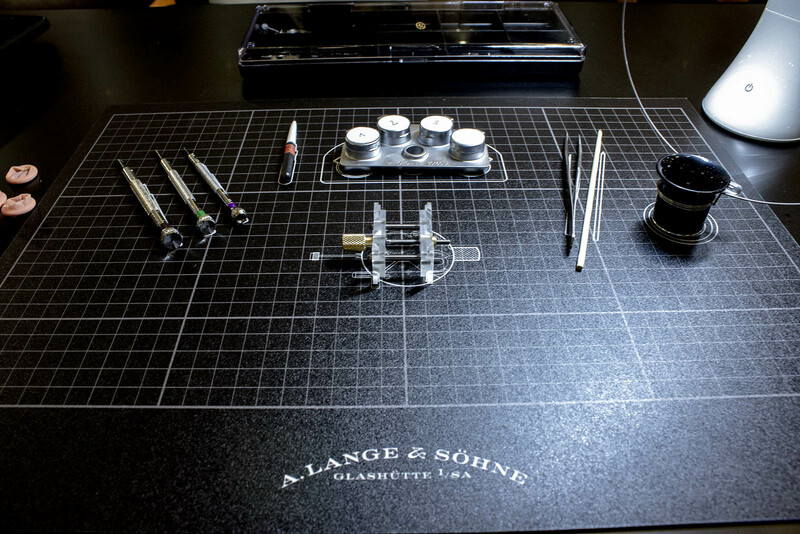 A. Lange & Söhne recently showed off its watches, expertise and heritage at a five-day exhibition in Singapore titled House of Lange, which took place in early July. 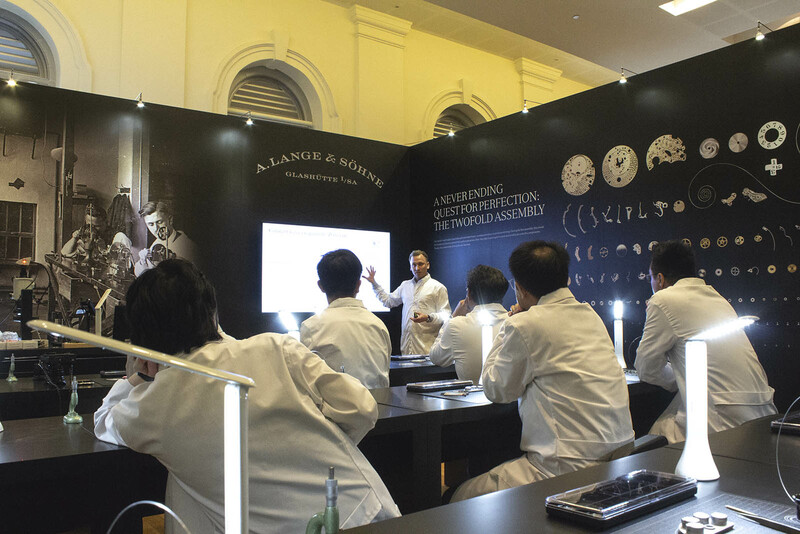 The event included a new module for the Connoisseur’s Akademie, a two-day training programme for watch collectors and retailers that includes workshops and hands-on watchmaking lessons. 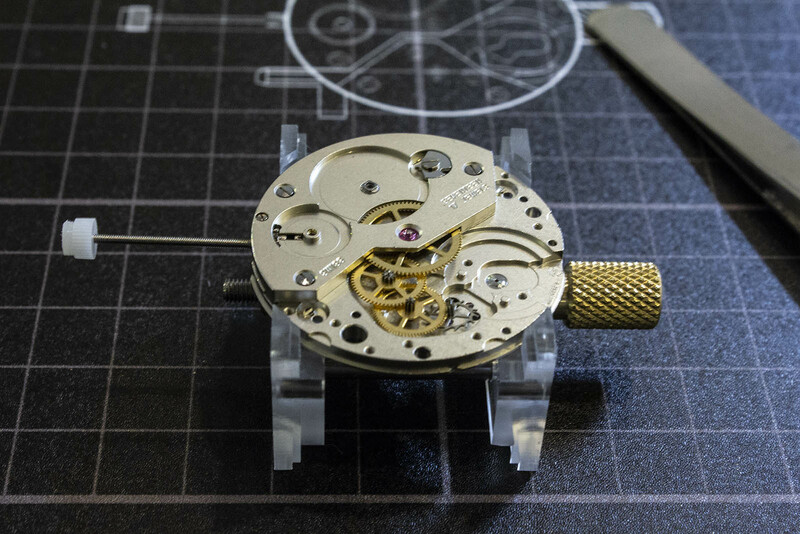 While the primer course of the Connoisseur’s Akademie focuses on the decorative aspects of the movement – where participants get to try their hand at tremblage engraving as well as polishing and installing gold jewel chatons – the latest instalment covers something more prosaic: the basics of the gear train. 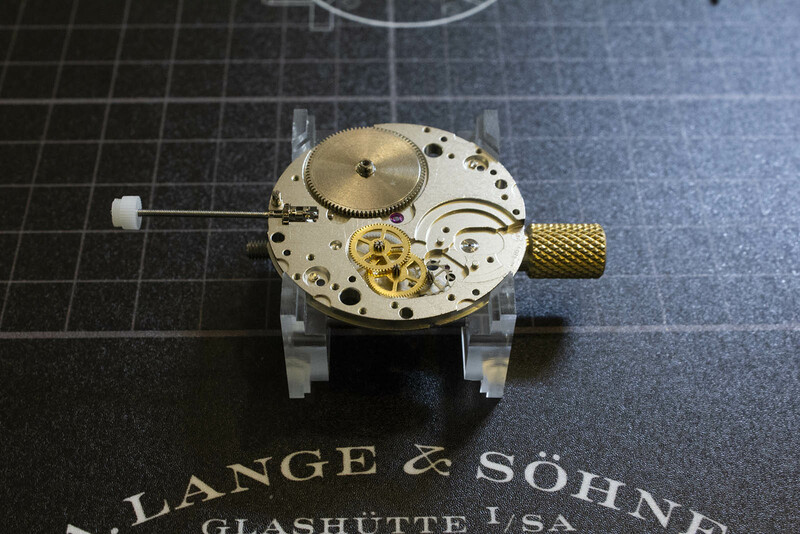 The teacher for the Connoisseur’s Akademie session was eminently, perhaps even overly, qualified, Robert Hoffmann, chief of the Zeitwerk department, which handles the assembly and regulation of all of Lange’s complex digital watches. Mr Hoffman started with a primer on the components and functions of the gear train, essentially the energy transmission system that goes from the mainspring to the escapement. With basic watch theory out of the way, the practical lesson got underway. 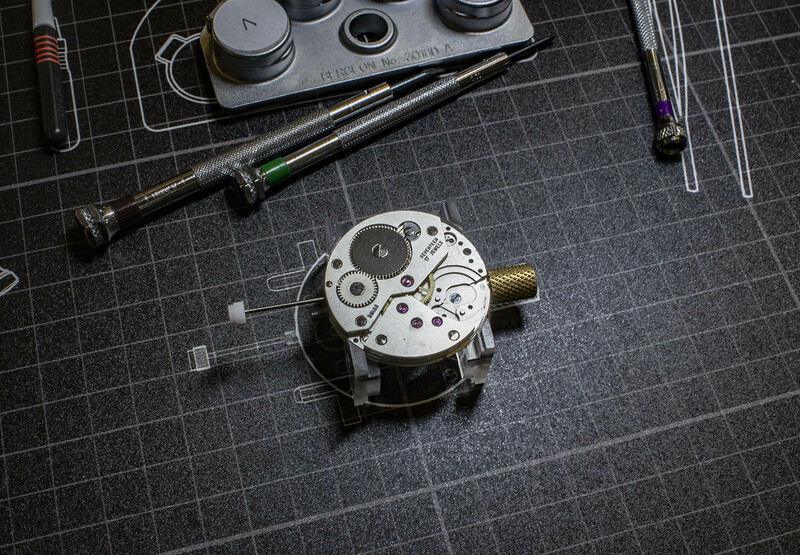 Attendees were put through the paces of assembling the wheel train in a Unitas 6498, a robust pocket watch movement that is large and straightforward enough to make it ideal for amateurs. One wag commented that Lange must have borrowed a few movements from sister company Panerai for the classes. 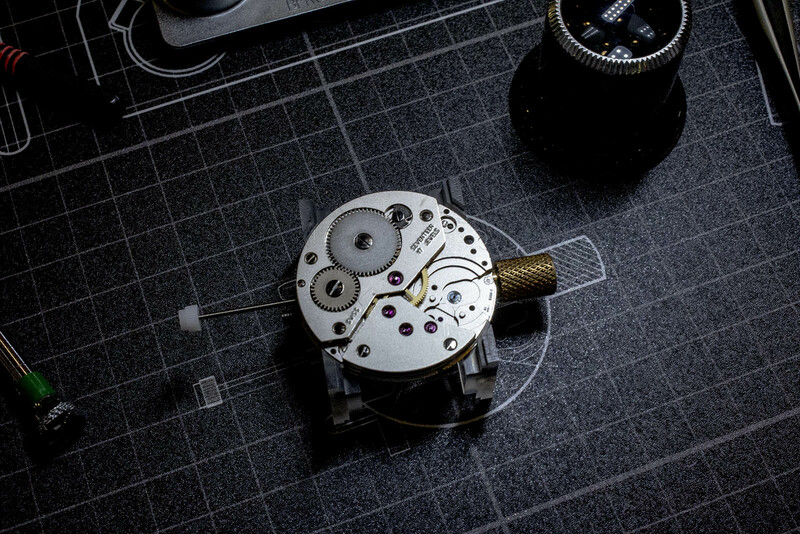 To that end, we were fully kitted out in a white watchmaker’s coat, and tooled up with latex finger cots, loupes, screw drivers, tweezers, oil and a box of seemingly microscopic movement parts, although in watchmaking terms the Unitas is an enormous movement. The first step in the process was to secure the main plate in a movement holder, and then lock it in place via a small thumbscrew. The next step was to nestle the escape wheel in a jewel opening. Characterised by club-shaped teeth, the escape wheel is designed to engage the pallet fork which in turn pushes the impulse pin on the balance wheel shaft, sending the balance wheel into a swing. Next, we set the complete barrel, which houses the coiled mainspring. The length and thickness of the mainspring is what determines the power of its output, and consequently, the power reserve. Due to the size of the Unitas movement, the largish barrel offers anything from a 40- to 56-hour running time. With the barrel in place, we began the assembly of the going train, starting with the fourth wheel, which directly drives the seconds hand. It makes one full revolution every 60 seconds and meshes with the pinion of the escape wheel. This is followed by the third wheel, which interacts with the pinion on the fourth wheel. And finally, we place the center wheel – the largest of the three wheels – in a jewel opening at the heart of the movement, next to the barrel. The teeth of the barrel interact with the pinion of the center wheel, which makes one revolution every hour, directly driving the minutes. Once the going train is completed, a barrel bridge is placed over the barrel and center wheel. After ensuring that the center wheel pinion is upright and in place, the bridge is then secured to the main plate with three screws. Then the wheel train bridge is installed over the rest of the gear train in the same way, ensuring that the wheels are aligned. 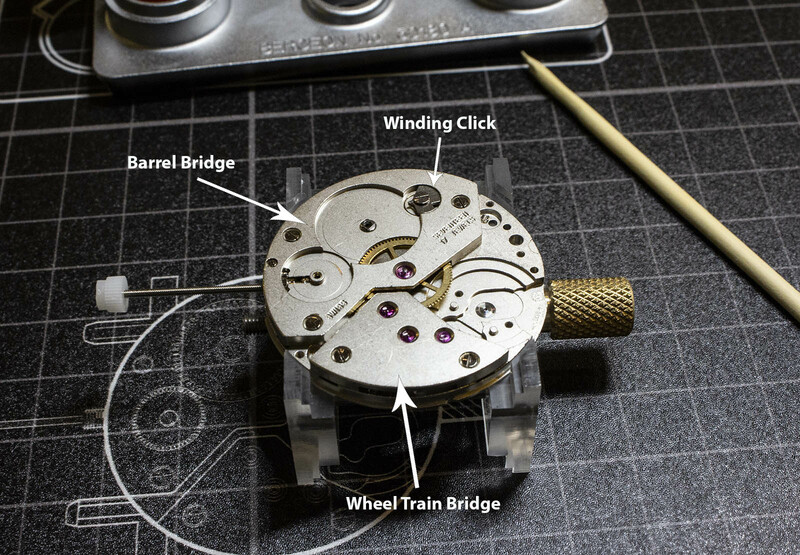 This proved challenging, particularly with the escape wheel, and the best way – in hindsight – was to install the screws with just enough tension to keep everything in place, while adjusting the pinions to ensure they are correctly seated in the jewel bearings. The next step was to install the crown wheel which sits between the winding stem and the ratchet wheel. The winding stem has a pinion gear that enables power to be transferred from the vertical stem to the horizontal crown wheel, which then engages the ratchet wheel. The final step was to install the ratchet wheel. The crown wheel is smaller with fewer teeth and relies on human power to generate the energy required to turn the ratchet wheel. As the ratchet wheel is wound, the mainspring is coiled tighter within the barrel. The winding click, which was already in place, prevents the ratchet wheel from recoiling during winding. It’s responsible for the clicking that is heard when the movement is wound. With the ratchet wheel affixed in place by a large screw, the transmission system is complete. Verifying that everything is in the correct place is easy. 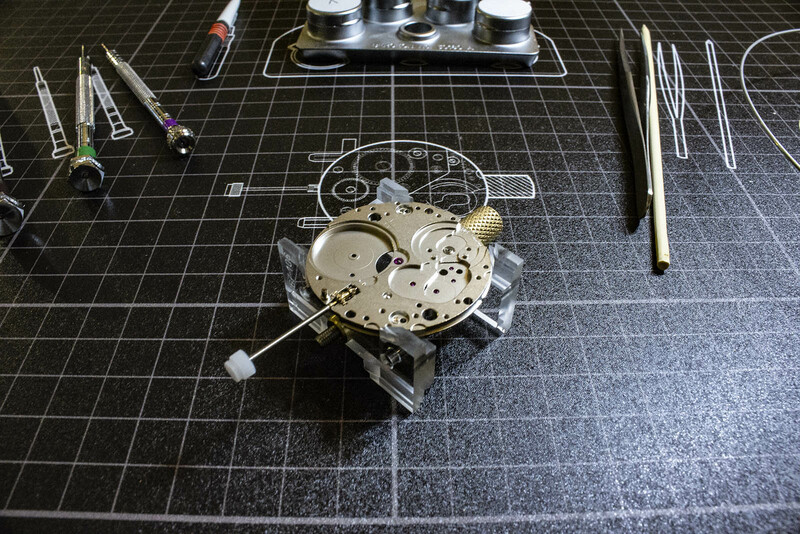 Turning the crown to wind the mainspring instantly sends energy through the gear train. 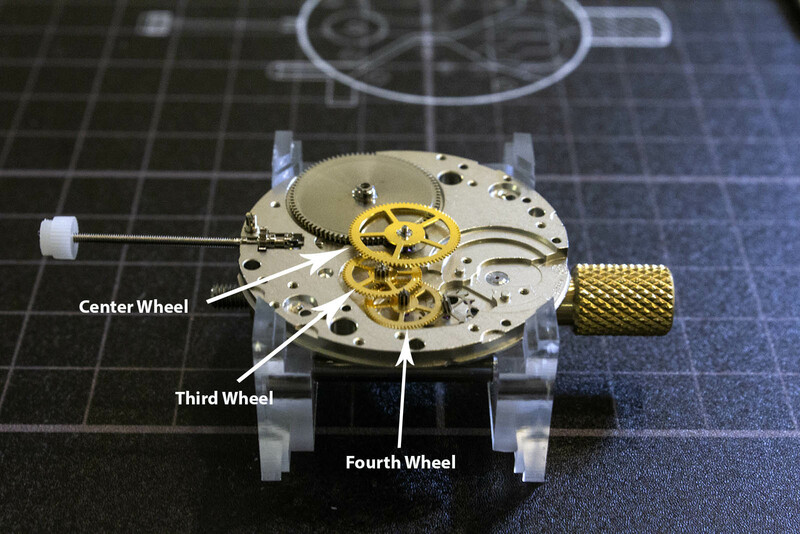 Because there is no escapement or balance wheel installed, the gears of the going train spin freely at high speed once the mainspring is wound. Captured in the video clip above, that’s both visible and audible, with the wheels making a smooth whirring sound that gradually tapers off as the mainspring winds down. 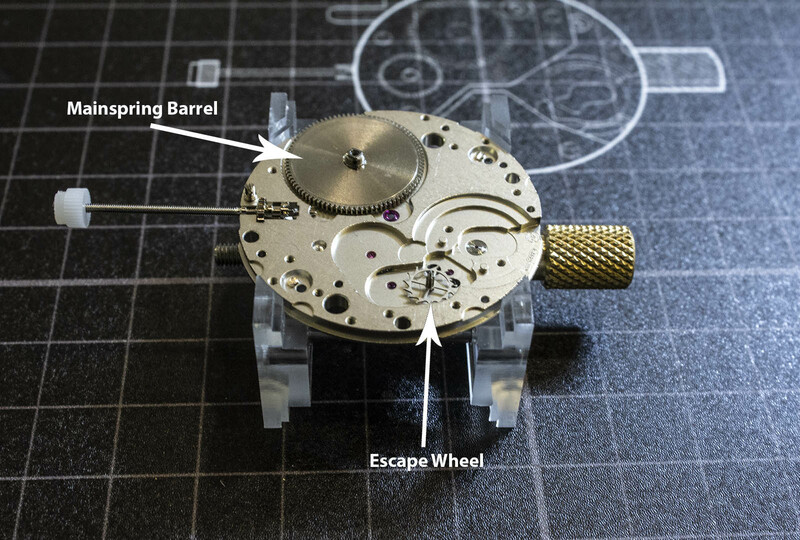 The class stopped at the escape wheel, leaving aside the balance wheel and hairspring, as installing the last two components is typically the most challenging part of the process. That’s not part of the Connoisseur’s Akademie yet. Future sessions of the Connoisseur’s Akademie will take place in cities around the world. Stay tuned for updates from your local Lange boutiques for news. A showcase of Breguet's rich history and modern day complications in the Philippines.